Easily manage email templates in Magento under one roof: verify your encoding and HTML tags, add a plain-text version to go past spam filters, easily add, find or replace variables in your emails. Why Magento emails hit spam folders? The mail server is not configured correctly. The Magento template is not encoded correctly. Incorrect use of HTML tags in email. The plain-text version of the email is missing. 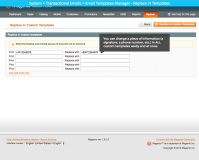 Luckily, you can use a Magento email templates manager to fix most of these problems! If your mail server is configured properly, our tweaks will help your emails to get past spam filters straight to your customers’ inboxes. The extension provides a great kit of flexible tools allowing to create email templates and format them in a way to fit each store’s unique business needs. This optimizes the efforts required for admin users to check and edit existing templates, resulting in higher email management efficiency and accuracy. With the help of the module, Magento admins are able to inspect critical email template parameters before sending them to customers. HTML tags, text, encoding and other aspects can be customized and checked in advance to ensure the emails are sent successfully. Even the most effective and catching email template may end up in a spam box of a customer if it is not configured in the right way. Thanks to the extension, store owners can improve deliverability rates by ensuring the proper format of their emails and double-check potential errors. This way the email will get to the target subscribers’ inboxes, as required. Successfully take your Magento emails past spam folders. 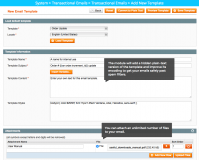 Ensure proper encoding of your transactional emails in Magento. Get any sloppy HMTL tags fixed. Adds a plain-text version that is not visible to customers. Conveniently manage all your email templates under one tab. Work with both standard and custom Magento templates. Attach files to your Magento email templates. Easy replace outdated information (e.g., old phone number) in all templates at once. The extension’s functionality is 100% Open Source. * Performance fix: recursive operations when sending mail are optimized. * Fixed the issue with "Convert to Plain Text" option. * Fixed the issue with subscribe/unsubscribe to newsletter from admin panel. * Bug with "Template Styles" data missing after "Generate Templates" action is fixed. * Fixed bug with overwriting templates for store-views with same names. * Fixed bug with incorrect working of filter. * Compatible with Magento 1.7.0.2. * Compatible with Magento 1.7.0.1. * E-mails aren't sent because of incorrect template. * Compatible with Magento 1.7.0.0. * Compatible with Magento 1.6.2.0. * Compatible with Magento 1.6.1.0 (minor fix). * Compatible with Magento 1.6.0. 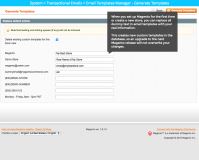 + When saving template changes you are redirected back to the E-mail Template Manager list . + Compatible with Magento 1.5.1. +The extension is compatible with Magento 1.5.0.1. * Bugfix - Some messages aren't sent if module enabled (ex. : message about new order - New Order template). +The extension is compatible with Magento 1.4.
all is perfect!! very good and all works very well! Faced with the problem that our shop’s e-mails fall into the spam folder. In search of a solution we found an Aitoc’s solution, install and it really works. Must have extension for those who are faced with the same problem. 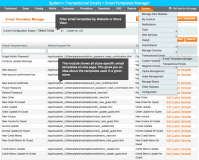 We were looking for a fast and simple way to customize all transactional mails. Of course we could do this the hard way. But with this extensions customizing is very fast and easy. Especially when you have multiple store views. Extension installation was a piece of a cake and the extension worked just straight out the box. 9/10 for me. And I think this is a must buy for every magento user. Great plugin with good services! I really couldn't recommend this module more. Once you use this to setup your emails you'll feel like laughing at all the hard work you put into your email. They give you a 30 day money back so you have nothing to lose by trying. Great job AITOC! I was getting very frustrated by the formatting of emails from my Magento store when I would read them in my Horde webmail. I was worried if they look that bad for me, how would they appear to customers. This extension is very easy to use and the email formatting looks great. Recover lost sales with automatic and responsive abandoned cart emails in Magento.